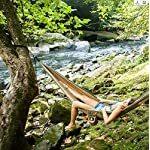 QUALITY YOU CAN CRASH ON: With this Double Camping Hammock from Legit Camping, you’ll have everything you need to relax in complete comfort on your next camping or hiking trip. Heading to the beach or taking in a festival? Don’t leave home without your parachute hammock. With its lightweight, spacious design and 400-pound capacity, it’s the camping companion you can’t go without. 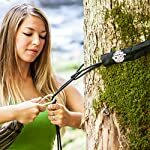 A CUT ABOVE: There are all kinds of camping accessories out there, but very few can compete with the quality you’ll find at Legit Camping. We create camping gear designed to stand up to the rigors of windy days, rainy nights and the wear and tear that comes with outdoor survival. When you go Legit, you say goodbye to shoddy construction and poor performance over time. Your hammock should work just as well five years down the line as it does when you take it out of the sack for the first time. 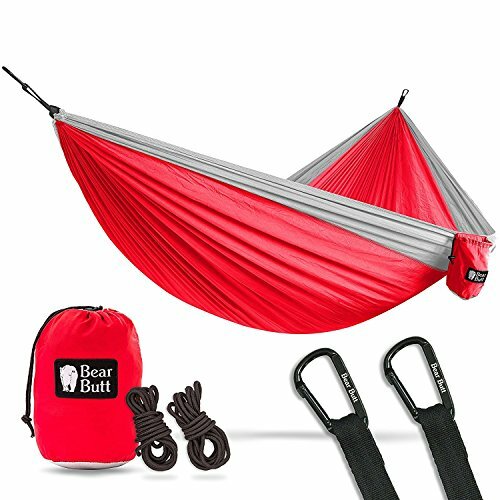 Have you had it up to here with portable camping hammocks that are not actually very portable? 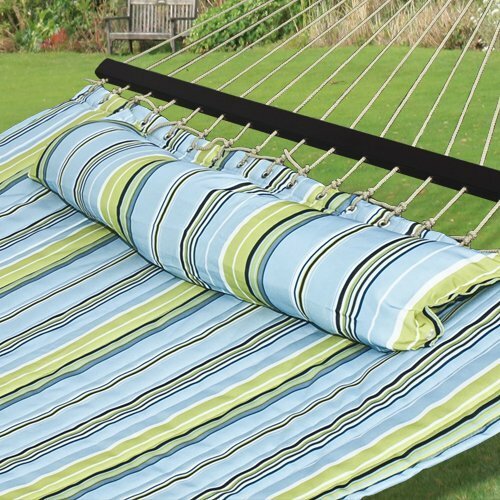 Have you tried to setup a hammock only to find out the straps weren’t included or the ropes were already fraying? 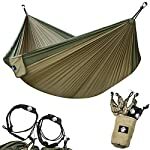 Then it is time to retire your raggedy old hammock and start camping the Legit way! 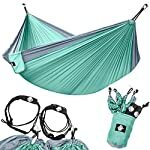 Take It Anywhere: Whether you’re ready for a rollicking good time at a festival or a peaceful evening on a pristine beach, our parachute hammock can go anywhere you go. Just stuff it in its special sack and be on your way. As long as the weather’s balmy, who needs pads or tents? Plenty of Room for Two: With some double hammocks, it can be an exercise in levitation and frustration just for the two of you to get comfortable. Not so with our double go back and forth hammock rated at a 400-pound capacity. And when we say comfortable, we mean comfortable. 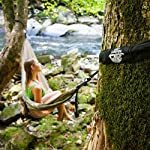 Tough Enough To Take It: We realize you will want to take your hammock on all kinds of amazing adventures, so we built it with that in mind. You’ll be able to find that not only is it ultra-light, but it’s sturdy and rugged enough to outlast any environment. 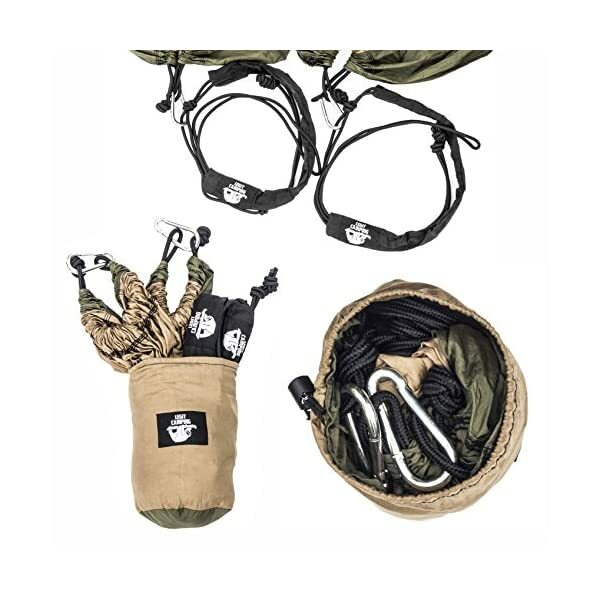 The included nylon straps safely wrap around most trees, and the steel carabiners ensure that you have no midnight surprises. 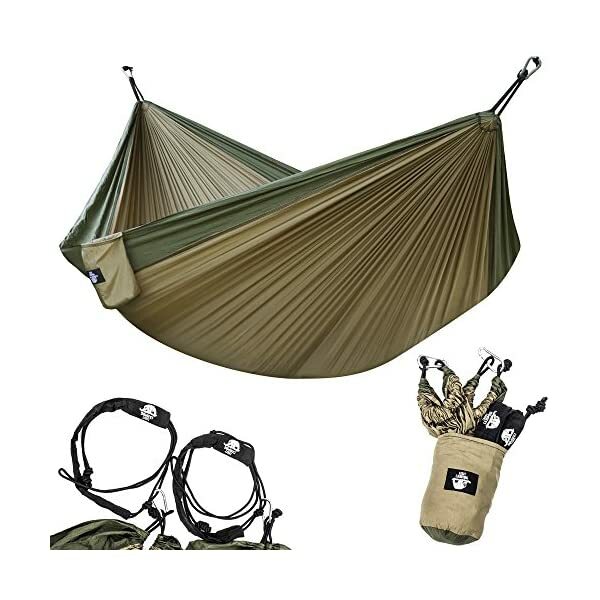 The Legit Lifetime Warranty: Your hammock comes with our Legit Camping Lifetime Warranty; if you don’t adore it, just let us know and receive a prompt refund. If anything goes wrong down the line, we’ll be here to replace it for you – no charge. What? 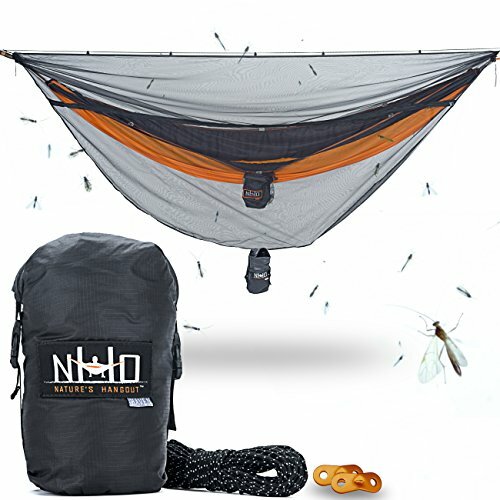 You’ve never felt the breeze as you gently swing in your Legit Camping Portable Hammock? Well, now’s your chance. 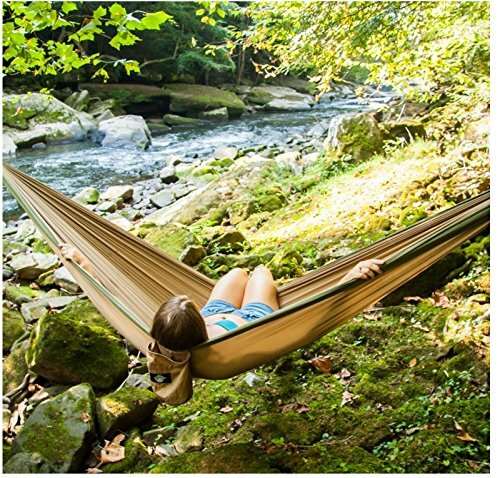 Take Advantage of Our Whopping Volume Discounts: Check the promo section on this page (look above) for the latest deals, add your hammocks to your cart, and start swinging! 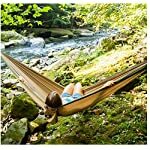 QUALITY YOU CAN CRASH ON: With this Double Camping Hammock from Legit Camping, You’ll be able to have everything you want to relax in complete comfort on your next camping or hiking commute. Heading to the beach or taking in a festival? Don’t leave home without your parachute hammock. With its lightweight, spacious design and 400-pound capacity, it’s the camping companion you’ll’t go without. A CUT ABOVE: There are all kinds of camping accessories out there, but very few can compete with the quality You’ll be able to find at Legit Camping. We create camping gear designed to rise up to the rigors of windy days, rainy nights and the wear and tear that comes with outdoor survival. When you go Legit, you say goodbye to shoddy construction and poor performance over time. Your hammock should work just as well five years down the line as it does when you take it out of the sack for the first time. 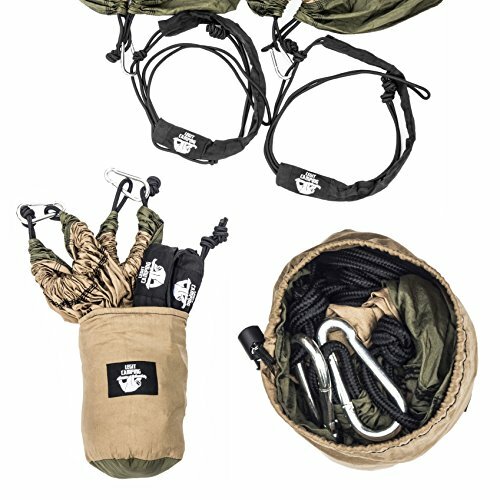 WRAP, SNAP AND SWING: We wanted to ensure that our backpacking hammock was easy for anyone to setup – whether you’ve worked with backpacking gear before or not. 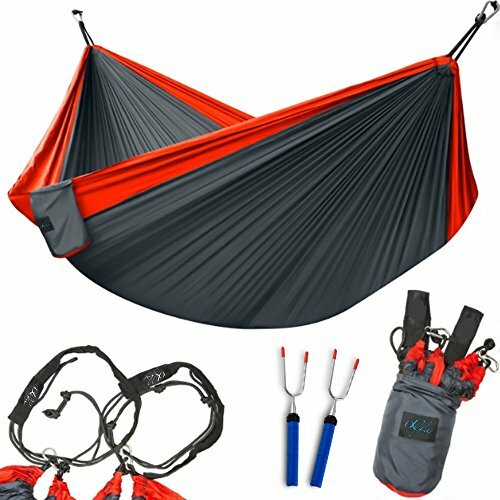 The first time you unpack your go back and forth hammock, You’ll be able to be blown away by just how simple it is. There’s plenty of room for two, and the military-grade 210T nylon fabric makes both a durable and comfortable bed. 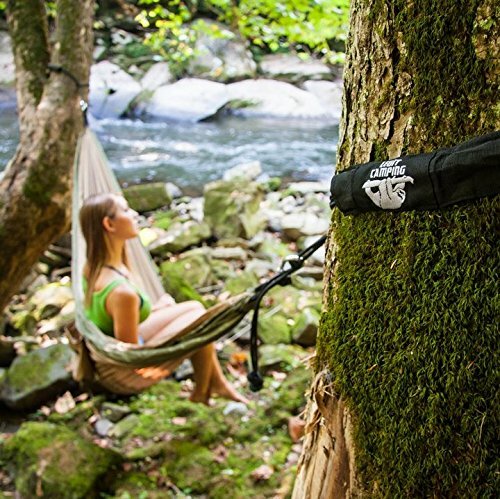 HAMMOCK FOR LIFE: We’re proud to provide a lifetime warranty on all our products. If for some reason you don’t like your camping hammock, just return it for a full refund. If something goes wrong, we’ll be right there with a replacement. That’s a lifetime warranty the Legit way. Are you ready to discover the peaceful, easy feeling of swinging yourself to sleep in the awesome majesty of nature? Use code “LEGITC15” at checkout for 15% off when you add 2 camping hammocks to your cart today!